If Pokémon GO is eating up your smartphone's battery power, try these handy power-saving tricks. This Pokemon Go Battery guide explains how you can save your smartphone's battery power while playing Pokémon GO. Saving your battery power makes it easier to go on longer trips to catch Pokémon, plus there's less danger of having your phone quit on you during a battle! Pokémon GO is an infamous battery-hog. If it's left to run on its default settings, it can easily gobble up 90% of your phone's battery usage in a single day. By comparison, regular use of Facebook might take up about 5% of your battery in a single day. Niantic is constantly working to make Pokémon GO less of a battery-drain, but it's not a bad idea to subscribe to these general power-saving tips in any circumstance. They apply to most smartphone models, and they should allow for tons of extra Pokémon-hunting hours. Some Pokémon GO players report they've saved their phone's battery life by downloading Google maps of their neighborhoods and then using them offline to catch local Pokémon. There's some debate on whether or not this works – one member of Google's Development Relations team says it doesn't – but it's certainly worth checking out for yourself. To try out the offline maps trick, open your Google Maps app, enter "Settings," tap the option for offline maps, then tap the "plus" sign and add your location. Pokémon GO already has a battery-saver mode, though you need to turn it on. Do so by tapping your PokéBall, and then "Settings." Then tap the empty circle next to "Battery Saver." To put Pokémon GO in battery saver mode, all you need to do is point your phone towards the ground. This turns off the screen when you're walking between PokéStops and Gyms. Don't fret about missing a catch, either: Your phone will vibrate when a Pokémon is nearby. If you're serious about your Pokémon training, you might want to invest in an external battery pack for your device. There are a lot of affordable options at your disposal, like the Quick Charge 2.0 Power Bank (which suits most Android-based devices) and the EasyAcc Solar Flashlight Outdoor Portable Charger (which suits most smartphones, and is particularly well-suited for outdoor use). Even though Pokémon GO has its own screen-dimming controls with its battery-saving mode, you might want to go into your phone's settings and turn off auto-brightening and auto-dimming entirely. Your phone uses a lot of juice to adjust to outdoor lighting. Instead, set your device to a stationary screen brightness. Somewhere between 70% and 80% should be enough. This trick is obviously only applicable if you're not too concerned about your phone's data plan. When Wi-Fi is enabled on a smartphones, it constantly sniffs for Wi-Fi hotspots. That puts a drain on your battery, so switching off your Wi-Fi can save you a small chunk of battery life. We've got plenty more Pokemon Go advice elsewhere on the site, including a guide to evolving Eevee, and how to level up and gain XP quickly. 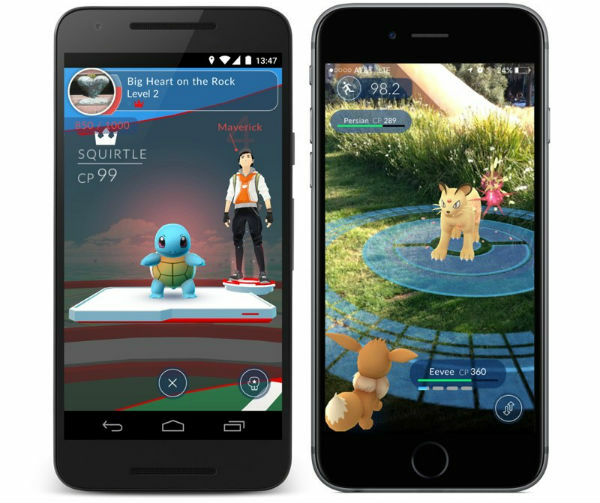 Tagged with Android Devices,	Guides,	ios,	MMOs,	multiplayer,	Niantic,	Nintendo,	Online gaming,	Pokemon,	The Pokemon Company.